Stranger # 05 – All Kids and All Smiles! Suspicious eyes were following our every movement. We were three girls lugging around huge cameras in our hands. It was remote and about sundown. We were camping in a school and there is not such thing as a lodge or hotel around. In such remoteness of Rajasthan which rarely sees a tourist soul I wasn’t too sure how the villagers would react to three strange looking people. After much deliberation and with great courage few kids started following us around. One even came to me with a sly look asking me to take a photo. With almost all of Rajasthan familiar with this tactic of asking to be photographed and then asking for money, I shied away with apprehension. But they persisted, the asked to be photographed and soon I realized it was not tactic but these kids were genuinely amused by us. They asked us many questions about our lifestyle. How different it was from theirs, they were surprised. They were shocked to know that three girls of marriageable age were roaming in the far corners without husbands around. They took us to their homes, showed us around and I promised to send them back their photos. It has been two months and the photos have been just printed. Hopefully they will reach Khaba in time. 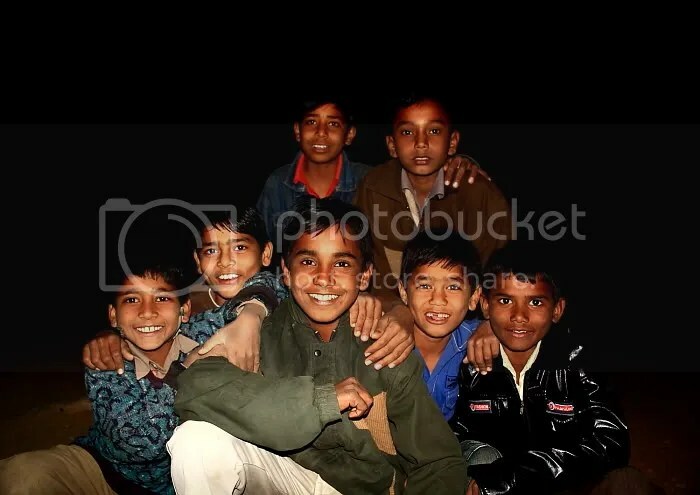 This entry was posted on March 24, 2011 by Neelima V. It was filed under photography, portraits, Stranger . “athiti debo bhabo” we indian still belive in this.the smiling is so rare in our face.if their smiling face can bring that in ours its awsome.